Fort Stewart - Hunter AirField is an U.S. Army base in Hinesville GA is near Savannah. It is home to elements of the 3rd Infantry Division, 75th Ranger Battalion, and Combat Aviation Brigades flying some of the deadliest helicopter gunships in the U.S arsenal. Fort Stewart is ideally located on 280,000 acres in the small coastal town of Hinesville,in Liberty County, Georgia not far from Savannah / Georgia's Atlantic Coastline. Stretching over five counties, Fort Stewart is the largest installation east of the Mississippi River and is used for the training of 50,000 reserve component soldiers each year. Mission: Fort Stewart and Hunter Army Airfield is the Army's world-class training, and military armored power projection combination on the Eastern Seaboard of the United States. This dynamic platform allows military units in the region to deploy rapidly throughout the world. The Stewart/Hunter Military Complex is responsible for organizing, directing, coordinating and controlling garrison support and service activities, including overall management of the garrison workforce. The command is composed of numerous directorates and organizations responsible for the day to day operation of the Stewart/Hunter Military Complex. The Garrison Command provides support to assigned, attached and tenant units or activities to include on post units and activities in the assigned geographic area. Fort Stewart is located in Hinesville, a small coastal Georgia town in Liberty County. Hinesville is a short distance from the Atlantic Coastline and about 41 miles southwest of Savannah. 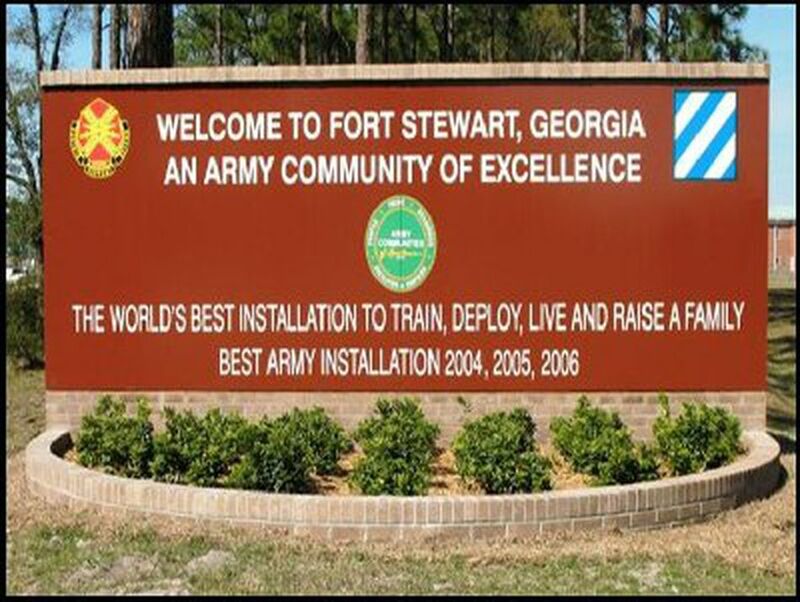 Fort Stewart has a total soldier population over 20,000 along with 30,000 family members. Army Lodgingis now IHG Army Hotels. A camp site at Holbrook Pond is available through outdoor recreation for rates ranging from $6-15 per day. Campsites are concrete slabs with water and electrical hookups. There is a central bathhouse and sewage dump station on the grounds. Make your reservations early by through the Camping Reservations Office. Family Housing on Fort Stewart is privatized and operated by GMH Military Housing. Soldiers must apply for housing within 30 days of arrival. If housing is not available, an active waiting list by grade and number of bedrooms will be established. Housing assignments will be determined by the amount of dependents and rank of service member. The rent allotment will equal the Soldiers BAH entitlement for their rank. Married Soldiers are required to live off post unless or until on-post Family housing is available. Single and unaccompanied Soldiers (E1 to E4) will be assigned a room in the post barracks during inprocessing. Rooms will be shared with one other Soldier. In some instances, E4s are allowed to live off-post with special permission. The Housing Referral Office at the Soldier Service Center's provides assistance and guidance in finding off post housing. Rental Rates in the immediate Hinesville area vary widely. The Department of Defense Education Activity operates three elementary schools on Ft. Stewart. Each school has exceptional children programs. To be eligible to attend, parents must reside in family housing on the military installation. There are no middle or high schools on the installation. Children in grades 7-12 attend school in the local community. Bus transportation is provided depending on distance lived from school. Before and after school care is provided by School Age Services. A variety of sports and extracurricular activities are provided through Child and Youth Services. The Liberty County School System has two high schools, three middle schools, and eight elementary schools. There are also three private schools and 1 alternative school, all accredited by the state. All the Liberty County public schools offer transportation to school.The Pryme Tyme program offered through the YMCA provides before and after school care at their respective schools for elementary school children. Each school offers before and after school, sports and exceptional student programs. For both Fort Stewart and Liberty County residents, adult education is provided through the Education Center. The Education center provides various opportunities for those wishing to further their education through various programs. Also located in Hinesville are two colleges, Savannah Tech and Brewton Parker. A School Liaison Officer (SLO) is located at each Central Registration Office. The School Liaison officer can be reached at (912) 767-6533. The SLO is there to provide information on local schools and assisting parents with special education needs and transition support. Full Day Care- offers developmental services to children 6 weeks to 5 years of age for working parents requiring childcare on a regular basis. Services for children 4 weeks of age are available for sole and dual military parents. Several services are offered for free during/for Deployment and discounted services are offered for Families of Deployed Soldiers. The Family Child Care (FCC) program offers quarters-based care provided by certified military family members from housing located on and off the Installation. Both the individual and the homes are certified by CYS before children may be enrolled. Winn Army Community Hospital, located on Fort Stewart, and Tuttle Army Health Clinic, located on Hunter Army Airfield, provide medical care for active-duty Soldiers, retired military personnel and all eligible family members. Winn offers a wide range of services. Some of the services include family practice, pediatrics, obstetrics and gynecology, physical and occupational therapy, social work services, behavioral medicine services, nutrition, internal medicine, optometry, radiology, laboratory and pharmacy. Winn also offers a variety of free educational classes, like Tobacco Cessation, Family strategies for staying healthy, and Diabetes Education. The Winn emergency department is open 24 hours a day, seven days a week for true emergencies. Tuttle does not have an emergency room. The Lloyd C. Hawks Troop Medical Clinic is for active-duty Soldiers assigned to the 3d Infantry Division and Garrison units. Services include primary care, pharmacy,laboratory and radiology. The Aviation Division at Fort Stewart is responsible for the overall management and operation of Hunter AAF, Savannah and Wright AAF, Ft. Stewart, GA. They also must maintain all supporting aeronautical organizations to include Air Traffic Control, Airspace Management, Navigational Aids Maintenance, Airfield Facilities and Operations.